Yep, still pregnant over here. I saw a post similar to this over on Running In Chucks this morning, and decided it would be a good one for today. As with most people who are pregnant past their due date, I’m getting a little impatient, and honestly a little bored just sitting around and waiting. The house is ready, we are as ready as we are going to be, and I know everyone else is ready and waiting for news as well. Sometimes during this time it is hard to find positivity, so I decided a post about happy things would be a good way to start my day, so here goes. Fresh fruit. I know this isn’t really the ideal time of year to be loving fruit, but it has been a must in my diet the past couple of weeks. I will admit that my diet these past couple of months has been less than stellar, (being hungry all.the.time and getting tired easily makes pre-packaged and takeout very appealing options.) but the last couple of weeks has been better with the return of fresh fruit and more meals cooked at home. 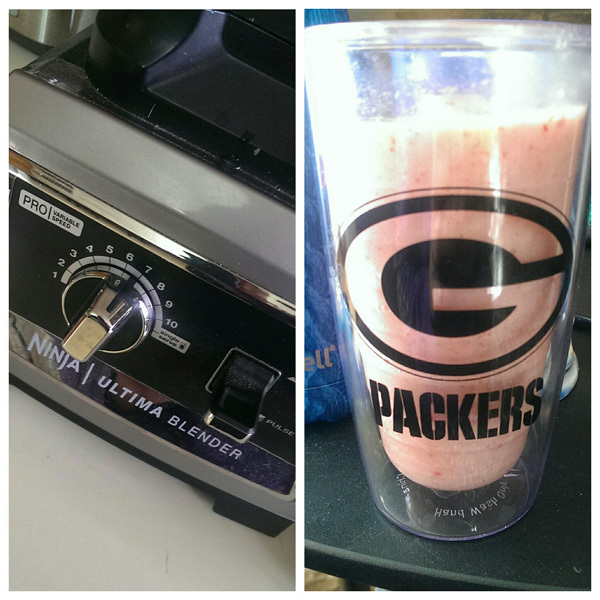 Speaking of fresh fruit, the Ninja Ultima Blender has made a return! I’ve decided that this will be the year that I learn how to make a delicious smoothie. I mean, smoothies aren’t difficult to make, you just need to throw in some fruits, veggies, liquids, whatever other things you want, and blend. But to make a smoothie that is the right consistency and tastes delicious takes a little more practice. I got The Part Time Vegetarian Smoothies and Juices Recipe Book (written by my blogger friend Tina of Carrots N Cake) for Christmas and I’m hoping it’ll at least give me some ideas and guidance for proper proportions. I think my biggest challenge is that I prefer my smoothies to be non-dairy – and I don’t mean just using a milk substitute – I mean that they are all fruit and vegetable and juice. I know it is more difficult to make that typical smoothie consistency with that type of formula, but if anyone has any tricks or recipes I’d love to know! Frequent trips to/pickup from Noodles and Company. Caprese sandwiches. This has been my go-to lunch for the past week or so. I will admit that I don’t put tomato on them, but the fresh mozzarella, fresh toasty sourdough bread, fresh basil, and lots of olive oil and garlic is an amazing combination. Molly posted a photo of Egg In A Bread In A Hole on her blog yesterday (a Sheetpan Suppers recipe of course) and I think it may be the next thing that I make from her cookbook. Tell Me: What foods are making you happy this week? For the smoothies: I use all frozen fruit and no ice. That + juice + Greek yogurt (which I guess doesn’t fit your non-dairy requirement) = love that texture! I’m with Julie…I use frozen fruit as the “ice” and then greek yogurt for protein and substance! Hope baby comes soon!